Hi. I'm looking for help to identify this bird. It was on coastal marsh land in Lancashire in late December 2016. Unfortunately it was at quite some distance (100m +) so I struggled to get any decent images. 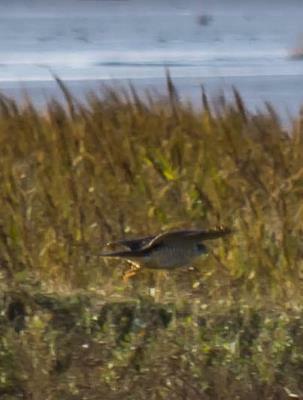 With nothing to gauge against for size I'd say it was as large as a Buzzard with yellow legs and yellow eyes. It flew low and slow along a water gully and landed 4 times on high vantage points (such as they were). While in flight its wing tips reached a straight down position. My first thought for an ID was Sparrowhawk but the size is all wrong and the facial markings (bottom image) don't match either. 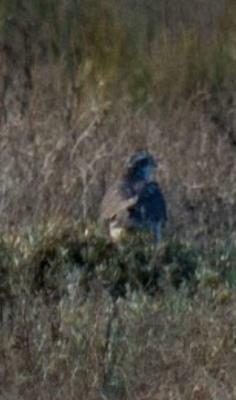 Could this be a Goshawk? There were two image links on the second post, the links have been removed in line with the Forum "Dos & Donts". If you are keen to add photos to the original post in the meantime, please use the contact us page (identify bird) and we will link the additional photos back if you use the same title as the original topic. 160 Thanks for the update. Being able to add further pictures on subsequent comments or the original post would be a great addition. What appears to have happened in this post it that my original 2 pictures have been replaced by the following two. They were in fact all different from each other. No matter, when you get a fix for the author update process I'll have a go at adding further pictures.